This week Peta is setting the challenge over at RoP/BnW. She wants us to make a X-mas gift or alter a project for X-mas. I (due to lack of time - yes I confess - it's hard to bake and create at the same time...hihi.....) went for a X-mas card and a X-mas gift bag. I inked up the very fresh and cute Christmas Hearth from the latest BnW release. letters JOY for my sentiment and a ribbon (from SU) + some dew drops. Sentiment from Aud Design - stating Merry X-mas in Swedish. Hope that you like it and want to play with us. Also REMEMBER - tomorrow is the first day in our Advent Calendar over at BnW. You do not want to miss that!! First of all - thank you soooo much for the wonderful and sweet comments on my project for the BnW blog hop. So much fun to see that so many of you wanted to join us and that you all agree: E Bell has done it again and thanks to Summer - we all can get a piece of her talent to work with!!! Today I have a short post for you - showing you the supersweet image Gingerbread corner. I coloured the cute images with my copics. DPs are from the Eskimo Kisses range - of course *lol*. Ribbon from my stash. 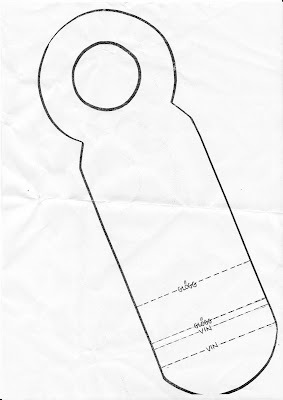 Many of you wanted the template for the bottle tag/box. I received it from our local shop - Pysselakuten at our local scrapevent Vänerscrappen Nov 14th. 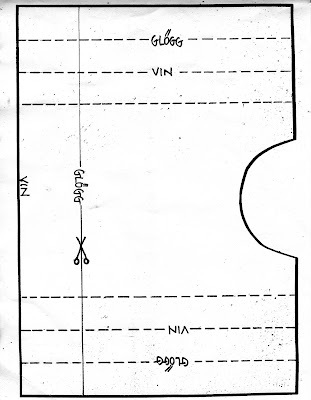 Here's the template. You see "Glögg" mentioned - that is our mulled wine that we drink - adding almonds and raisins in the Glögg and then drink it while we are eating Gingerbread cookies. Vin = Wine. where to attach the box to the tag. I hope that you will not have any difficulties in putting this one together. Don't hesistate to email me if you have any questions on how to put this together. Here's the result again of the one that I made for the blog hop. You can of course alter it and decorate it as you see fit. Kram and looking fwd to hear from you. Happy Tuesday to you all and it's time for another Try it out Tuesday! TIOT is all about using buttons on your cards/projects. Well - I do love my buttons from the Eskimo Kisses range - so I had to use them of course. Also - you NEED to check out the glitter buttons that Susana has in store for us.... they are a MUST HAVE!! I decided to make a triangle box - since they are so easy and fun to make (thanking my sweet friend Iris for learning me how to create one). Coloured Lily and Billy with my copics. I do hope that you've noticed that Susana has refills for the most popular copic colours. Higlighted spots on the image with 3d gloss and white inkssentials pen. Cut out snowflakes with my punch. Added the buttons and tied a knot with brown scrappers floss on each and one of them. Closed the box with ribbon from my stash and then I added the sentiment - from Aud design - God Jul 24/12 = Merry X-mas (since Santa arrives on the 24th in Sweden). BnW Blog hop is here!!! Finally it's Monday! I've been waiting for this blog hop and I hope you all have as well. 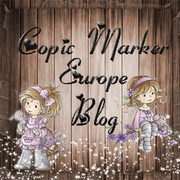 Again - Elisabeth has done it again - and I'm sure that you all are going to NEED (yes - you'll need them - I can hear it already ;-) all these new cute stamps. So what are we presenting this time - well no cookies - but different ideas for gift wrapping, bags etc. 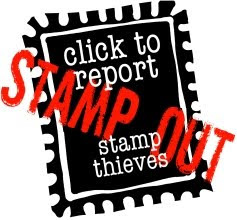 Make sure that you stop by each and one of us - since one lucky winner will be able to win the full set of these stamps! For all details - please read carefully on the BnW blog - so that you don't miss the chance to win these cuties. 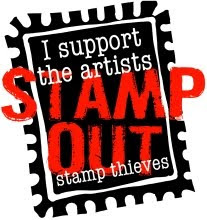 The stamps will be up for pre-order today as well - so make sure that you order them now. Well - as for my project I wanted to create a bottle tag/box. We received a lovely template at our local scrapevent - Vänerscrappen (Nov 14th), but I did not have the time to try one then. So of course I thought this would be perfect to go with my card featuring Two Turtle Doves. Of course I filled it with candy and Swiss chocolate (X-mas chocolates with almonds). I went for a little more vintage style this time on my card - and therefore I also wanted the bottle tag/box to match. I will post the template on the BnW blog later this week - for those of you that would like to try it. This cute little girl looks very Swedish to me. Why?? - you ask - well - it's because she's wearing a Folklore bonnet. I used to have one - but with roses - when I was a baby girl :-). As you can see - I went for a distressed look. Coloured her with my copics. The roses were sent to me by my sweet friend Marlene - love them. Chalked around the edges (after using Tim Holtz distress tool) with pine cone + on the flowers. Looking fwd to hear from you. And now you are off to Iris blog to see what she's been up to! 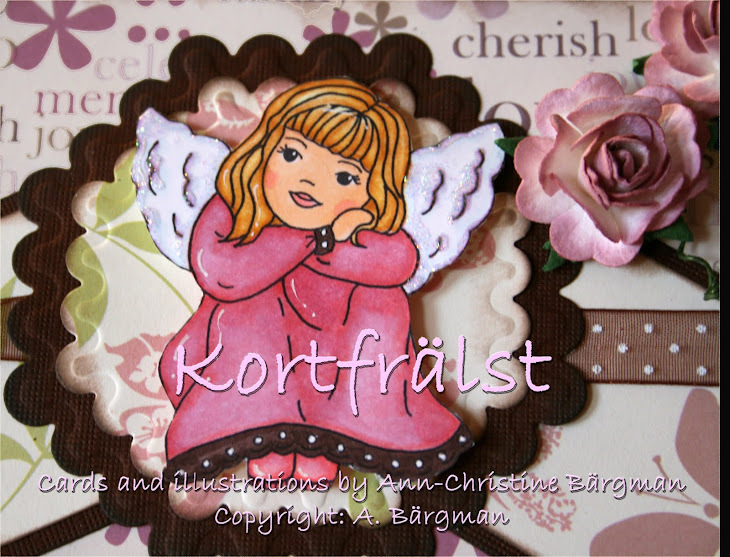 Just another quick post from me - with the picture of my card that won 3rd prize at Vänerscrappen. This time we should make a vintage looking card. Well - You know me - I love colour - but actually - I loved making this one. Once again - image sent to me by supersweet Tammi. Flowers from wonderful Marlene and my stash. Sentiment from Prickiform. And yes - I promised to show you what I won during this event - well - see below. Kram and happy Saturday to you all! Just a quick update from the Bärgman-Margitin family. Isac is doing so much better. The medicine is working and hope that he will be fine soon. The Scarlet Fever seems to be going away. Hubby is not doing well though. He still has a lot of pain in his neck from the car accident last week (where he was hit from behind while he was driving home). He's going to the hospital today to get an X-ray. I want to thank you all for your sweet comments and for thinking of us - I so much appreciate that. It's so wonderful to have such caring friends - even though we've never met in real life - you all are so amazing - remember that! I also won a third prize in another challenge and then 1st price in a Scrapbooking Bingo. Will show you the prizes in another post + the card that I won 3rd prize for. Kram and hope you all will have a very creative weekend! What can you do when there's nothing on the TV and you need a little inspiration to get your mojo back? Well - I just love to watch movies and cuddle - don't you :-) One of my favourite movies is Sweet November. I watched it with one of my sweetest friends - Georgios (my Greek little bro) in Zürich many years ago. He could keep his eyes on Charlize Theron and I had Keanu Reeves to look at ;-)) (Well - my sweet little Greek bro Georgios is also a very good looking guy) It's a very romantic movie, but also one that really touch your heart. So that's why I decided to let this movie inspire me to create a Romantic card. That's what the challenge is about - to create a Romantic or Sweet card. I used my cute little GF images (thank you Tammi) to create a virtual Keanu and Charlize ;-). Made a card for a couple to wish them all the happiness in the world. Kept a very clean layout and got to use some of the stunning roses that my sweet friend Marlene sent me for my b'day. The DPs are from my very sweet friend Tammi - that she sent me on my b'day. Added a few blings and there you have it. Hope you would like to play along with us. Also - remember - there's a new BnW hop coming your way soon. Keep your eyes open for November 23rd. I promise you - it's sooo worth it! 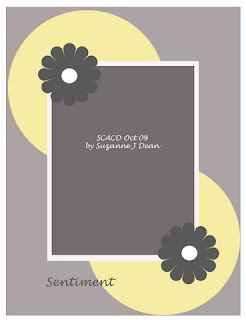 Hope you are having a wonderful Tuesday and that you don't miss this weeks TIOT over at SCACD. I could not participate myself - since Isac is ill again. This time he's got the Scarlet Fever. We got some medication for it yesterday - so he is doing so much better. I will try to join in for the TIOT later this week. Also - I wanted to show you a wonderful card and pressie that arrived from sweet Caz! Don't you just love it - well I def. do - so THANK YOU so much again Caz! PS. I will not be able to visit so many of your blogs this week - but of course I love to hear from you from the posts scheduled for this week. Coloured the image with my copics. DPs are Basic Grey and I went for - as always these days - a clean layout. Chalked around the edges with pine cone. You can find all the DPs and the embellies here. Wishing you a wonderful weekend! 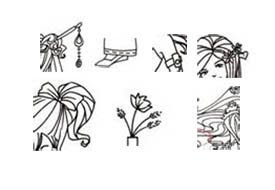 And also - I would love it if you would link to your card/project where you've used one of the BnW stamps. Please leave the link with your comment below. Welcome ladies to another fun release of the Elisabeth Bell designs for SCACD. You find these wonderful Sampler Edition 2 stamps here as of today at 06:00 AM Californian time. Jennifer - Dianne - Suzanne - Carolyn - Susan - Anki - Lorelie - Danni - Aud. I got the lovely task to present Fashionista. I love her and she so reminds me of the girls/ladies that I used to read about in my teenage magazine - Starlet - sweet, cool and gorgeous!!! I coloured her with my copics and since she's into fashion - well then I found the perfect Basic Grey DP to match her outfit. Went for a very clean layout and added a couple of blings and the heart charm. Hope you like her as much as I do and now you are off to Lorelie's blog to see what she's been up to. Also - looking fwd to hear from you what you think of her. Kramis and have a fun blog hop and shopping! This weeks TIOT is to create a scene with one of the images from the lovely Winter Wonderland release over at SCACD. 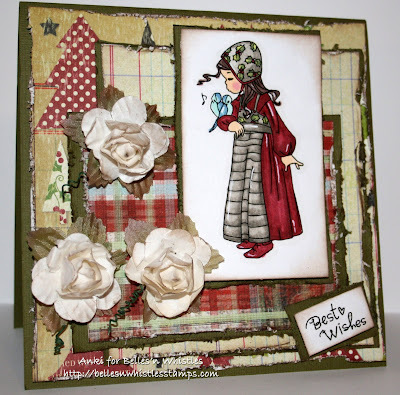 The Winter Wonderland stamps are perfect to create any winter card that you want to make - or for the upcoming holidays. Added the sentiment "A Winter Day"- sent to me by sweet Kathy, some pearls, snowflake charm and ribbon from my stash. The DP is from our local craft shop Pysselakuten. Hope you like it and that you want to play with us on this challenge. Have a wonderful day and remember to stay tuned for the blog hop coming your way later this week. coming your way this week! We are going to have a fun blog-hop again with the SCACD team showing of some new wonderful images by Elisabeth Bell. I'm sure you are going to love them - but also - I think you are up for something very fresh, new and creative. So I bet that it will be a positive surprise for you. Make sure that you mark Friday the 12th in your calendar. Also - if you haven't noticed it yet - but Susana has a blog candy up on the store blog in order to celebrate the new release (that we are going to show you on Friday). So click on the below pic and it will take you to the fun news. and also - thank you Wynneth for your sweet card with Victoria and the stamped images that arrived. 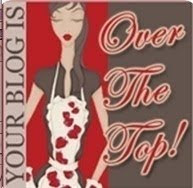 Make sure that you stop by these supertalented ladies blogs. I am so honored to have you as my friends! Love and a huge thank you again!!! This week Suzanne has made a wonderful sketch for us to play with. I had a lot of fun with it and almost - note almost - followed it exactly. See if you can see what item that I moved to another part of the card?? I used my Basic Grey Wisteria DPs for this card. I think it turned out really pretty. The image I used is the Suprise from the E Bell Ornament Serie for SCACD. I used did not use the cute little puppy on this one. Coloured her with my copics. Cut out the circles with my nesties. Added the flower part with my SU punches and my flower punch. Added a little spacer in the center. I also cut out smaller flowers with my punch and added Bella Baubles in the center. The sentiment is a Susanament - and there you have it! Hope you like it and looking fwd to read your comments. and I got Belle singing for me - but not only that - I got the honor to pick the first winner from our blog-hop!!!! So if you are curious - then pop over to the BnW blog. I also want to send a big thank you to all of you for your lovely comments on our BnW blog-hop. We are so happy to hear that you love these cute images as much as we do. Elisabeth has done it again! Her illustrations rocks!!! And so does Summer who turns them into these wonderful stamps - so that we all can play with them. Thank you sweetie! So nice of you and what a lovely award as well! Pass this award on to five people, post on their blog to let them know that I left this award, and then I need to answer a list of questions with ONE word. So I decided to colour this cute new image from the Belles'n Whistles collection- Twas the night before Christmas. Coloured the image with my copics and highlighted some parts with Polar White Flower soft. DPs from my X-mas stash :-). Did not want to use too many embellies - since I wanted the DP as my X-mas scene. Added the sentiment "Från oss alla till er alla en riktigt God Jul och Gott Nytt År" = From us all to all of you - a very Merry X-mas and Happy New Year, ribbon and Basic Grey Button.